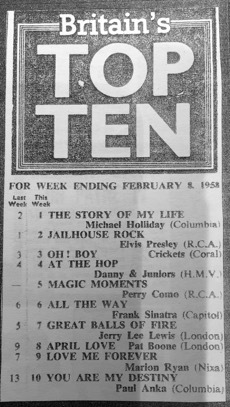 Sixty years ago this month - January 1958 - the world changed for a young British pop singer called Michael Holliday - courtesy of two up and coming American songwriters called Burt Bacharach and Hal David. Bacharach and David first met in 1957 in the Brill Building in New York and started writing songs, David’s lyrics a perfect fit to Bacharach’s melodies. One of the first products was a song called “The Story of My Life”. It was picked up by the American country singer, Marty Robbins. His single hit No. 1 in the American country charts, but flirted only with the lower reaches of the mainstream Billboard Top 100. It was the story of Robbins’ life. All too often, he would hit upon a song and take it the top of the country charts, and then find someone else had taken the honours in the mainstream listings. The one exception was his record of “El Paso”, which topped both sets of Billboard charts in 1959. Back in the late Fifties, the world was a small place - no satellites, no internet, no social media - and what happened in the States stayed in the States, at least until the carrier pigeons made it across the Atlantic. Britain’s pop culture closely followed that of America, but usually about three months behind. What’s more it was often the case that a British artiste had more success at home with a cover version displacing the original American hit. So it was with “The Story of My Life”. No fewer than four British singers released competing versions of the song and all of them, with the exception of Robbins, made the UK charts. The Robbins version had a strong country-music feel to it, but the tempo of the recording was slow and the vocal sounded laboured. The closest British version to it was recorded by Gary Miller, an also-ran vocalist of the decade who ironically is best remembered now as the singing voice of Troy Tempest in the Gerry Anderson puppet series Stingray (he was the one who sang “Aqua Marina” over the closing titles). Two other British versions were launched by Dave King, a popular singer-comedian, and Alma Cogan, the girl with the laugh in her voice and known for her hooped skirts and sequinned fashion. Both King and Cogan had their share of hit records in the 1950s, but by 1958, their hit-making days were largely over. Enter Michael Holliday. Born in Liverpool in 1924 as Norman Milne, Holliday first made his presence felt on British television in 1955. A record test at EMI’s Abbey Road studios soon followed and by the end of September that year, Columbia A&R man, Norrie Paramor, had Holliday’s debut single, “The Yellow Rose of Texas” in the shops. More TV and some modest hit singles followed, but by the end of 1957, Paramor and Holliday were still looking for the song that would give them their big record. 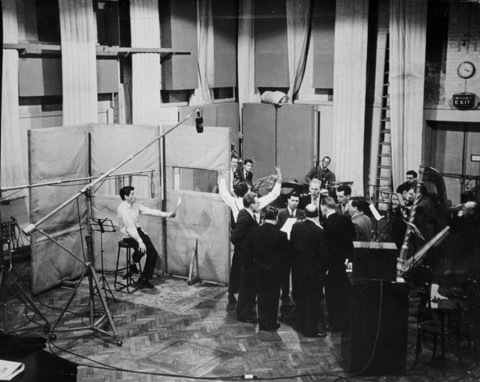 Paramor knew that he had found it the moment that he heard Bacharach and David’s song, and he lined it up for Mike to record at an Abbey Road session on 10 December 1957. He passed on the job of arranging and conducting the tracks to Ken Jones, the first Holliday session where he had not taken the baton himself. Jones took much from the original Robbins arrangement, but critically, he upped both the tempo and the key. The first change gave Holliday’s record a more upbeat, brighter feel and the key change forced his man to sing higher than normal. Holliday was a bass-baritone, who copied and uncannily replicated the voice of his idol, Bing Crosby, so much that he was known as “Britain’s Bing Crosby”. But Jones’ arrangement for “Story” denied Holliday the chance to do a Crosby impression. It was the first time that Holliday had stepped outside of Crosby’s shadow. It took 12 takes for Paramor and Jones to be satisfied that they had hit material in the can, and as Michael Holliday headed home to Surrey late that Tuesday evening, he had had scant recognition that he had just recorded the song that would be forever associated with him. 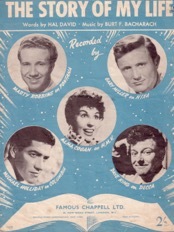 All four British versions were released in the first week of 1958 and entered the UK charts during the middle of January, with the Holliday and Miller versions making the pace. But whilst Miller’s record peaked at No. 14, the Michael Holliday version stormed on. It reached the top spot in the first week of February 1958, displacing Elvis’s “Jailhouse Rock”, and held the stop spot for two weeks before itself being overtaken by another Bacharach and David song, “Magic Moments” by Perry Como. 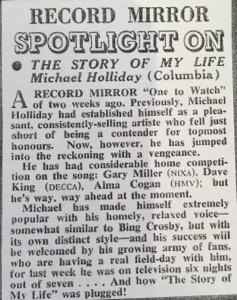 Michael Holliday held onto the No.2 spot for another 4 weeks, and eventually clocked up sales of over 750,000 on both 78 and 45 rpm discs. Michael Holliday’s life and career were the never same again. More hits - “In Love”, “Stairway of Love” - followed in 1958 and two years later in January 1960, “Starry Eyed” gave him his second No.1, the first number one record of the new Sixties decade. His own BBC TV series also began a long run in 1958 and by the end of that year, Holliday was established as one of the biggest stars in British show business. Sadly, his time at the top was short-lived. A nervous, insecure individual, he found that the stardom he craved brought nothing but pressures that he was unable to cope with. Most of the inner turmoil he suffered was concealed from his army of fans, who reeled from the shock of the morning headlines on 30 October 1963, when the news broke that Michael Holliday had died the previous evening from an overdose of sleeping tablets.